Psychologically a very tough hilly energy sapping route – Kingfisher Drive Merrow Park up to Merrow Horse and Groom along A246 to Clandon traffic lights down to Clandon Station back up to traffic lights along past Hatchlands Lotus Duke of Wellington Pub Ramada Thatchers Legacy Hotel past Effingham Golf Course Past King George Playing fields back to Clandon lights back to Clandon Station back to Clandon lights then home = knackered but not too shabby for my slowest training run. 3. Tuesday – killer 2 hour gym session all on legs 80 minutes the fast treadmill & cycling after that! Week Finishing 8th Feb: 1. Sunday – super circuit 1000+ calorie session with my poorly shoulder 2. Monday – 8.5 miles (including 10 x 800 metre sprints / 1 hr 4 mins / average pace 7:25 3. Tuesday – hard gym session all on my legs 75 minutes 4. Wednesday – rest day and children’s soft play 5. 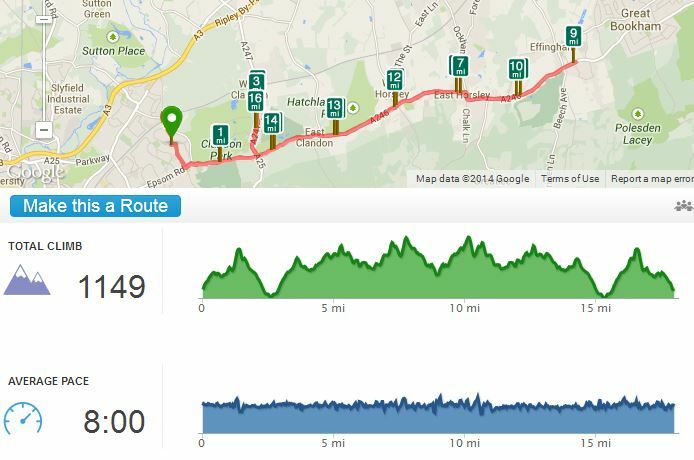 Thursday – 14 miles run in rain with a nose bleed 10 miles onwards! 1 hr 46 mins av pace 7:36 6. Friday – 9.5 miles run (including 2 x 3 miles fast / 1 hour 13 minutes / av pace 7:40) 7. Saturday – rest day! Week Finishing 31st Jan: 1. Sunday – hill running walking circuit training club 60 minutes 2. Monday – 13 mile run 1 hour 40 minutes average pace 7:43 3. Tuesday – hard gym session mainly on my legs 75 minutes 4. Wednesday – 90 minutes Red hot yoga 38 to 42 degrees Celsius studio 5. Thursday – 9 mile run 1 hour 8 minutes average pace 7:36 6. Friday – 8 mile run 59 minutes average pace 7:24 then two hours soft play with two energetic sons 7. Saturday – rest day!